One of Vietnam's richest business tycoons has been arrested on suspicion of lending fraud, authorities say. 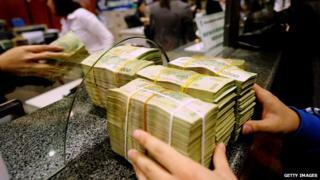 Vietnam's Central Bank also announced on Friday that it had suspended Mr Tham from his bank chairman role. The Central Bank said Mr Tham was "personally responsible" for some serious violations of the law but did not give further details. In June, another one of Vietnam's richest men, Nguyen Duc Kien, was sentenced to 30 years in jail for tax evasion and illegal trading. In Kien's case, observers have suggested that the charges against him were a result of an attempt to weaken the position of Vietnamese Prime Minister Nguyen Tan Dung, an associate of Kien. Power struggle behind soccer tycoon's arrest?